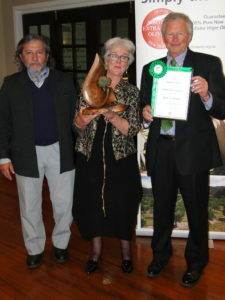 Once again The Olive Press (TOP) and Wairarapa olive growers have cleaned up at the annual Olives NZ Awards, announced on 13 October 2018. Loopline Olives’ Kate & Mark Bunny collecting their “Best in Show” trophy from Head Judge Esteban Santipolio from Argentina. 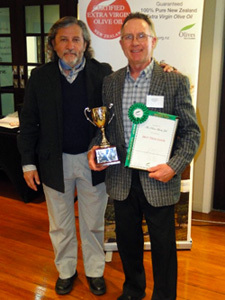 Loopline Olives from Wairarapa took out Best in Show and also Reserve Best in Show while Juno Olives from Wairarapa also did the ‘double’ taking out Best in Boutique and Reserve Best in Boutique. Best Flavoured Oil went to The Olive Press (that’s us!) who also took out Best Processor. Loopline Olives is owned by Mark and Kate Bunny. It is a medium sized grove of approximately 900 trees established in 2001. This is the 3rd occasion that Loopline Olives has won the supreme award, having taken out the top award in 2014 and 2017. They have been consistent medal winners at other previous Awards. Here’s Bruce McCallum’s summary of how we did. TOTAL MEDALS AWARDED: 109; we pressed 29 (27%). Last year 95; we pressed 36 (38%). The thing I notice this year is the total number of medals is up, but of the total, 50 were from Auckland/Northland/South Island – this is a large increase on last year – I think because Auckland and Northland were pretty much wiped out last year by weather and disease. SUPREME AWARDS: 5; we pressed them all (including one of our own oils). Last year we pressed 4 out of 5 (also one of our own). BEST IN CLASS: 16; we pressed 9 (56%). Last year 13; we pressed 8 (62%). Between TOP and Il Falcone we won two Best In Class, as we did last year. GOLD MEDALS: 28; we pressed 12 (43%). Last year 13; we pressed 8 (62%). Interestingly, of the total number of medals (109), 28 were gold (double last year), 77 Silver and only 4 Bronze. The quality across the board appears to have been very high this year. In the above categories where our %ages were lower, our numbers were up. The lower %ages is a reflection of higher numbers entered from Auckland/Northland/South Island. We still dominate at the top end, where it really counts in this competition. Thus BEST PROCESSOR, fifth year on the trot. See the Stuff article here and the Wairarapa Times Age story here. This entry was posted in Uncategorized on 15/10/2018 by ponatahi.